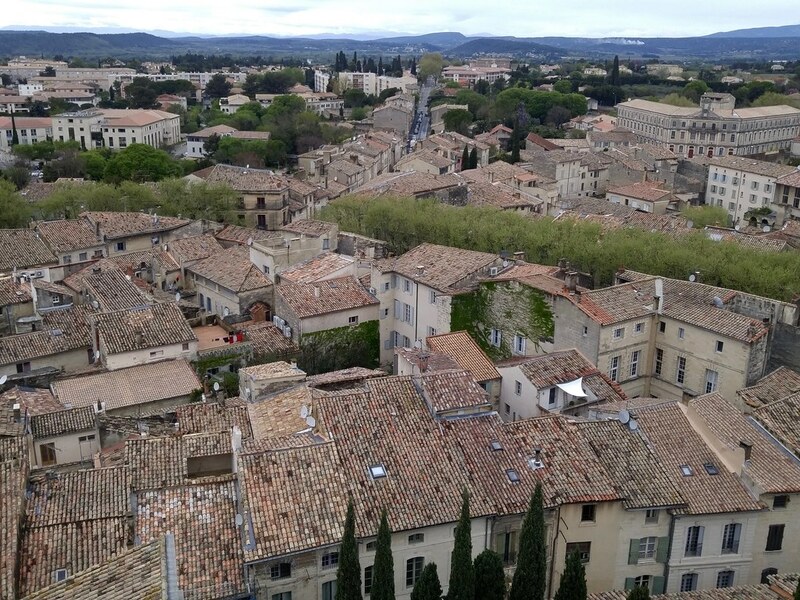 At the end of last week I read that there was an interesting Roman site being uncovered in Uzès (pronounced "Oo-zez"), once called Ucetia, and that impressive mosaics would be shown to the public this weekend before they were dismantled and boxed up to be archived or displayed elsewhere. I left Montpellier this morning to see the ancient site of Ucetia. Uzès is 85 kilometers, or about 75 minutes, from Montpellier. I was alone on this trip, because Ruth and our kids are in Paris for the weekend. Along the way I stopped at Ambrussum, a site I visited in 2009. There's a new museum at the Ambrussum site. It was closed for lunch when I arrived, which I expected because lunch, epecially on the weekend, is a big deal in France. 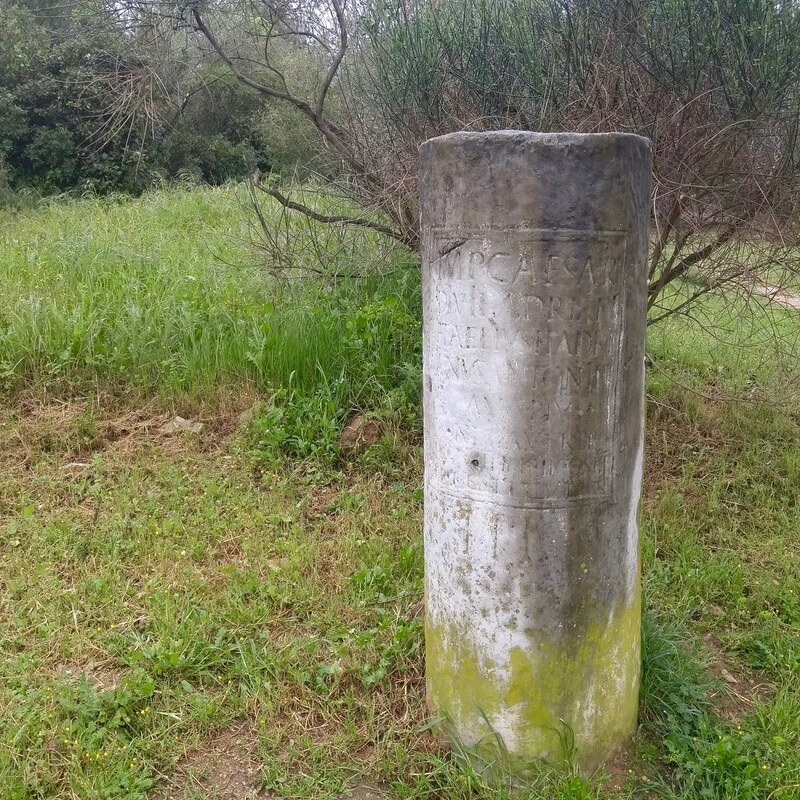 Roman milestone. If it was from the Ambrussum site, I think there'd be a note about that. According to signs at the site and Wikipedia the Romans standardized the construction of rest stops every 20-30 kilometers on roads such as the Via Domitia. 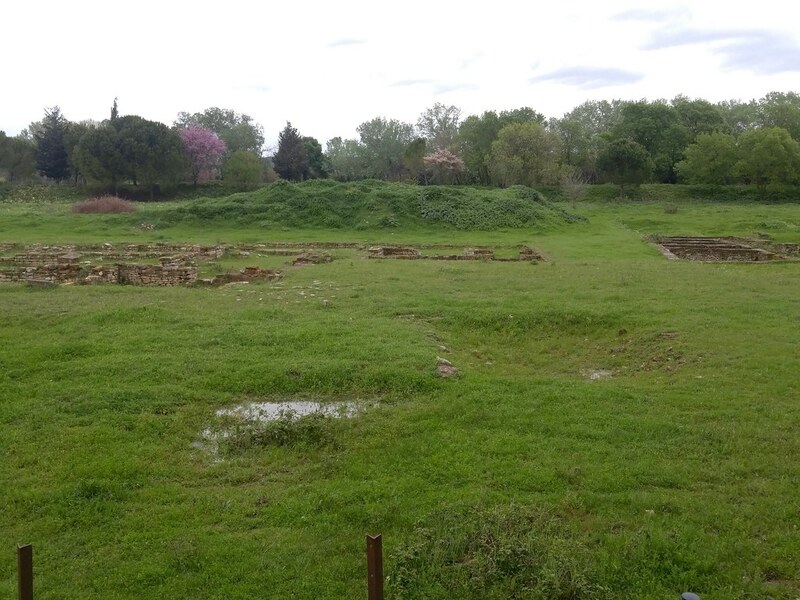 The foundations of such a stop have been excavated at Ambrussum. It was halfway between Nemasus (now Nîmes) and Sextantio (now Castelnau-le-Lez, the village across the Lez from Montpellier). Remains of the ancient rest stop on the Via Domitia. 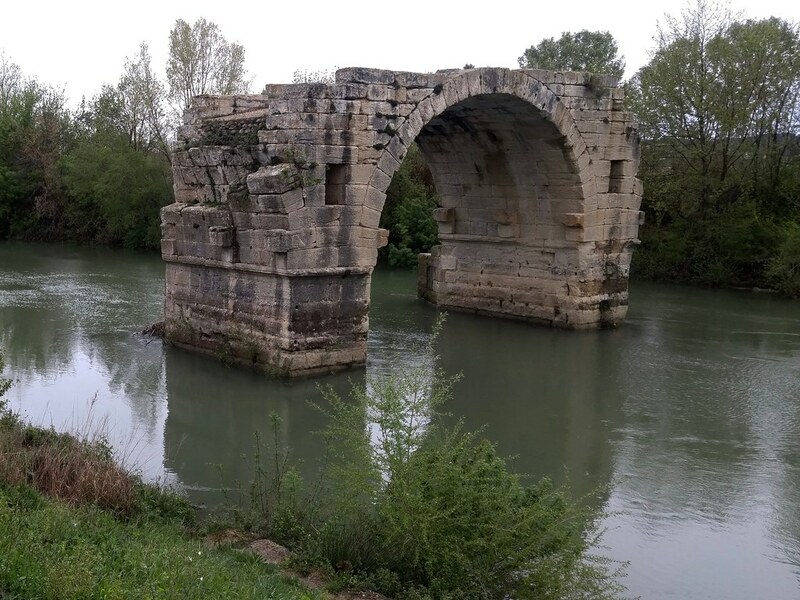 First century AD truckers bound for Narbonensis or Hispania who stayed at this station would have crossed the Vidourle on an impressive 9-arch bridge. In 1740, there were 3 arches. When Gustave Courbet painted it in 1857, there were 2. Only one arch remains today. I forgot to take pictures at the modern Ambrussum rest stop on the Via Domitia when I pulled off to fill up the tank of my car (€1.45 per liter). It's the first weekend of Spring Break for families with kids in Zone C (including Montpellier, Paris, and Toulouse) and the rest stop was very busy. After leaving Ambrussum I kept going past the usual Nîmes exit and got off the A9 at Nîmes Est. I took the D127 to Poulx and then the D135 and D979 to the gorge of the Gardon and the Pont Saint-Nicolas, a 13th century bridge over the Gardon upstream from Pont-du-Gard. Beyond this bridge, it was a only a few kilometers through the vineyards to Uzès. I found parking just outside the center of Uzès and hustled to the archaeological site to find a bunch of disappointed French folks and this sign. Mince! 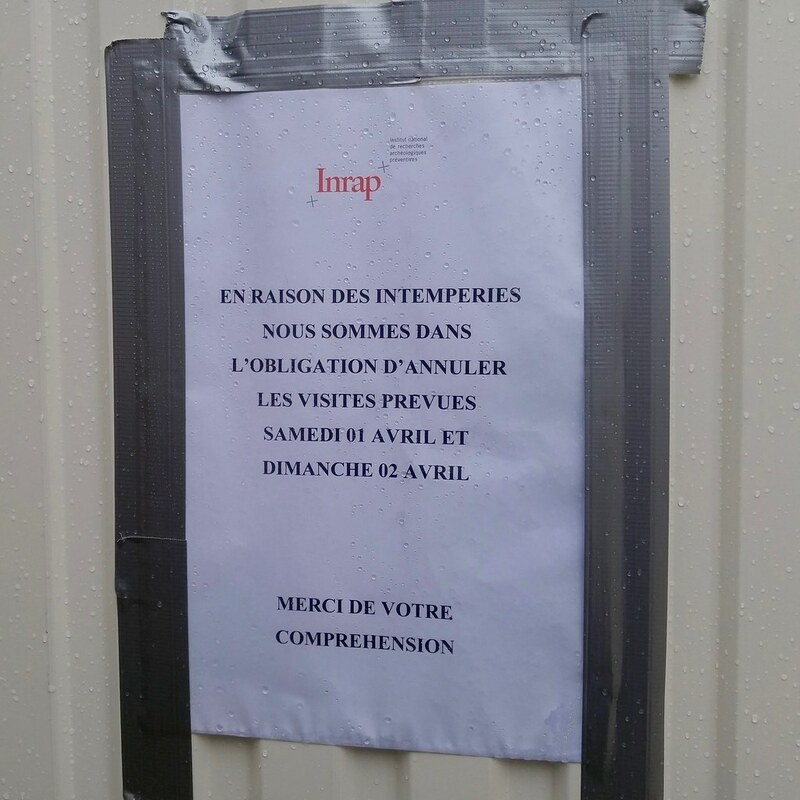 "Because of bad weather we are obliged to cancel the visits to the site Saturday and Sunday." Happily, Uzès lives up to its reputation as a town with much to see and do. I tasted a couple white wines at Domaine Saint-Firmin, right around the corner from the site, and bought a carton of bottles. After this I found my way to the historical center. 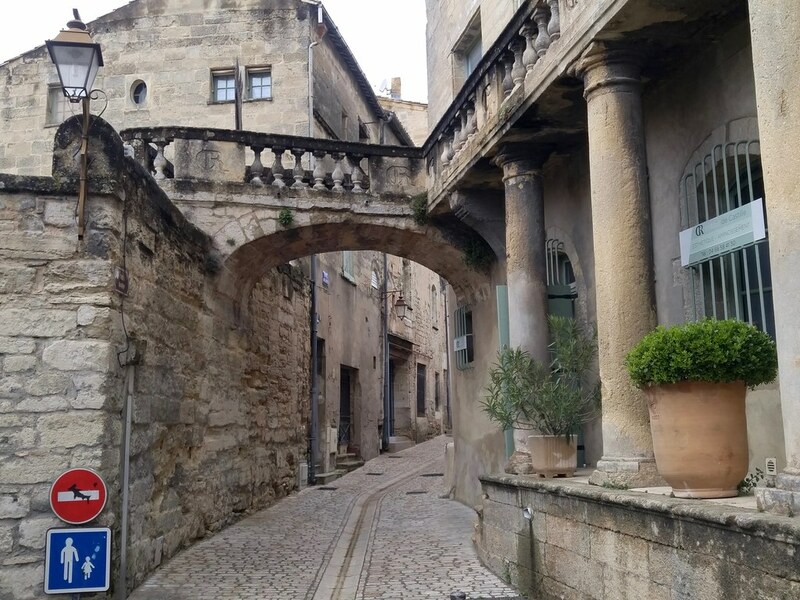 An entrance to the pedestrian center of Uzès. The Duché was an interesting site and there are great views from the tower. Tour groups arriving at the Ducal Palace. The stairway to the tower had 125 steps and I shared them with a gaggle of older French tourists. It was funny listening to them heckle each other on the climb. View to the North and the Cévennes from the Ducal Palace tower. 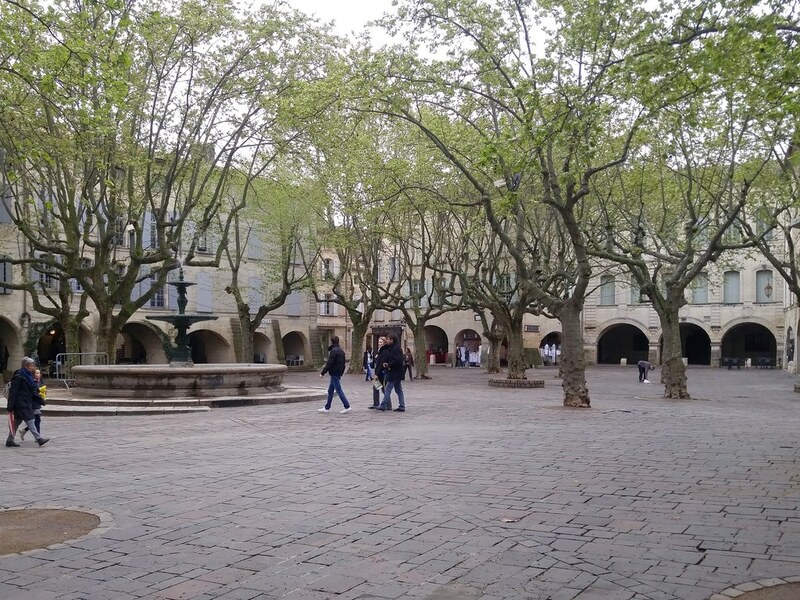 The town's market square, the Place aux Herbes, was quieter than usual on account of the rainy weather, but I still enjoyed exploring it. All around the edge of the square were arcades occupied by shops and cafes. I've seen these kinds of arcades in Torino, Italy. There's nothing quite like them in Montpellier. 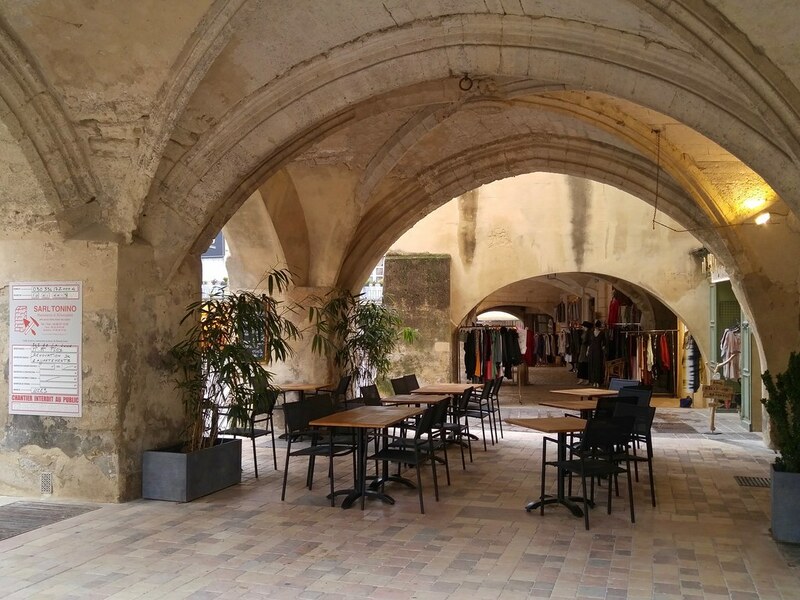 Cafe and shop in an arcade at Place aux Herbes. There are definitely no public spaces like this in Fort Collins, Colorado. 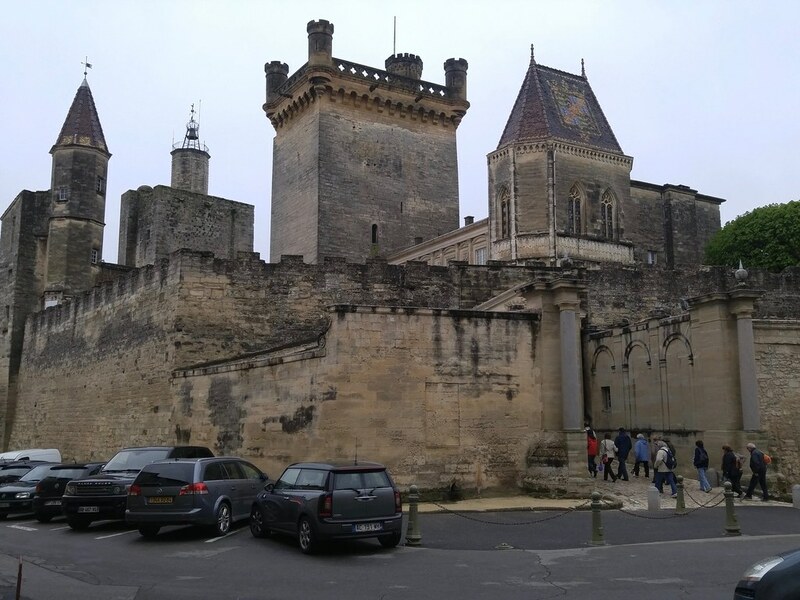 I failed to find Ucetia on this trip but I did discover that I'm a fan of Uzès. I would love to bring my family here if there are other public tours of the archaeological site this spring.